Diabetes and Animal Fats: The Sugar Disease, or something more? Is Diabetes truly the Sugar Disease? Here’s something interesting. There’s actually growing evidence that insulin resistance and risk of type II diabetes – long toted as the sugar disease – might actually be caused by too much meat (1,2,3,4,5,6). Dr. Neal Barnard has been researching plant-based treatment of diabetes for many years with very persuasive results. We saw a pretty interesting talk by one of our favourite plant-based doctors, Neal Barnard, who began by noting that diabetes rates were much higher in Western countries than many developing countries whose diet is traditionally high in carbohydrates, the food group often blamed for this epidemic. Take Japan – traditionally on a diet of rice, diabetes rates were 1.4% before 1980 - when fast food arrived, and dietary fat began to shoot up as carbohydrate intake fell. By 1990, diabetes was at 11-12%. Two studies looked at Seventh Day Adventists, a naturally fantastic control group since not all of them keep to the vegetarian diet like they should but nearly all avoid drinking and smoking and lead a healthy lifestyle. They split them into herbivores and omnivores, and found that those that ate meat had double the incidence of diabetes (1,3). 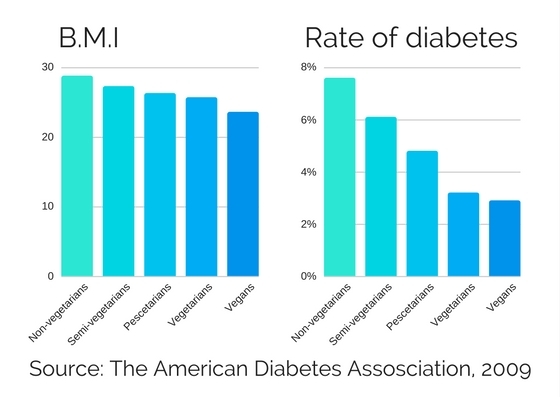 In 2003 Neal Barnard and his team actually tested a vegan diet against the American Diabetes Association’s recommended diet for diabetics, which reduced carbohydrates and calories. They found that though both diets reduced glycemic and lipid control, the improvements were actually greater with a low-fat vegan diet than the one the health organisations are promoting! Pretty crazy, right? Spurred on by this, we looked further and further through every study of diabetes and plant based diets. We found that EVERY SINGLE STUDY shows the same thing – a plant-based diet, even one with carbs, will improve your diabetes. Medical schools teach that diabetes never goes away – it is a progressive, permanent disease. But plant-based doctors are documenting thousands of cases of diabetes reversal. It mostly comes down to fat. Glucose cannot get into our cells without insulin. It’s like a key that attaches to cell receptors to let glucose into the cell. Since meat products are much fattier than grains, veggies and legumes, a meat eater’s high dietary fat dumps more of this intracellular fat into the cells (14) , and ‘clogs’ the receptors so insulin can’t open them up (11,12,13). However, when you adopt a plant-based diet, your intramyocellular lipid concentrations drop and you become more insulin-sensitive (15). If you start early enough, the diabetes can go away. Even people that had suffered from diabetes for years and years found their conditions improving. Visceral, or belly fat has also been linked to insulin resistance and risk of type two diabetes. This is down to increased inflammatory cytokines from visceral fat cells (10). Eliminating meat from your diet reduces visceral fat and improves insulin sensitivity compared to a regular diabetic diet (9). Very concentrated in meat, too much iron can damage insulin-producing pancreatic cells (16) - even slightly raised iron stores increase your risk of diabetes (16,17). However, studies show that reducing your iron intake can help prevent insulin resistance, type 2 diabetes and diabetes complications (18). Only when you’ve an excess, mind – Iron is pretty important in the old bloodstream! But the resounding problem is how to change people’s minds with the powerful nutritional marketing of the meat industry in the last decades. Meat is so embedded in our culture that it will take a lot to break through these habits, but for our health, and the health of our children and even our planet, cutting down can be the best decision you will ever make. For more of this, check out What The Health, a great documentary going into more detail about the reasons the healthcare industry is so set in their ways. 4. Fung TT, Schulze M, Manson JE, et al. Dietary patterns, meat intake, and the risk of type 2 diabetes in women. Arch Intern Med. 2004;164:2235-40. 5. Song SJ, Lee JE, Paik HY, et al. Dietary patterns based on carbohydrate nutrition are associated with the risk for diabetes and dyslipidemia. Nutr Res Pract 2012;6:349-56. 6. Barnard ND, Katcher HI, Jenkins DJ, et al. Vegetarian and vegan diets in type 2 diabetes management. Nutr Rev 2009;67:255-63. 9. Sparks, L.M. ; Xie, H.; Koza, R.A.; Mynatt, R.; Hulver, M.W. ; Bray, G.A. ; Smith, S.R. A High-fat diet coordinately downregulates genes required for mitochondrial oxidative phosphorylation in skeletal muscle. Diabetes 2005, 54, 1926–1933. 10. Petersen, K.F. ; Dufour, S.; Befroy, D.; Garcia, R.; Shulman, G.I. Impaired mitochondrial activity in the insulin-resistant offspring of patients with type 2 diabetes. N. Engl. J. Med. 2004, 350, 664–671. 11. Krssak, M.; Petersen, K.F. ; Dresner, A.; DiPietro, L.; Vogel, S.M. ; Rothman, D.L. ; Roden, M.; Shulman, G.I. Intramyocellular lipid concentrations are correlated with insulin sensitivity in humans: A 1H NMR Spectroscopy Study. Diabetologia 1999, 42, 113–116. 12. Perseghin, G.; Scifo, P.; de Cobelli, F.; Pagliato, E.; Battezzati, A.; Arcelloni, C.; Vanzulli, A.; Testolin, G.; Pozza, G.; Del Maschio, A. Intramyocellular triglyceride content is a determinant of in vivo insulin resistance in humans: A 1H-13C nuclear magnetic resonance spectroscopy assessment in offspring of type 2 diabetic parents. Diabetes 1999, 48, 1600–1606. 14. Hamdy, O.; Porramatikul, S.; Al-Ozairi, E. Metabolic obesity: The paradox between visceral and subcutaneous fat. Curr. Diabetes Rev. 2006, 2, 367–373. 15. Kahleova, H.; Matoulek, M.; Malinska, H.; Oliyarnik, O.; Kazdova, L.; Neskudla, T.; Skoch, A.; Hajek, M.; Hill, M.; Kahle, M. Vegetarian diet improves insulin resistance and oxidative stress markers more than conventional diet in subjects with type 2 diabetes. Diabet. Med. 2011, 28, 549–559. 17. Hua, N.W. ; Stoohs, R.A.; Facchini, F.S. Low iron status and enhanced insulin sensitivity in lacto-ovo-vegetarians. Br. J. Nutr. 2001, 86, 515–519. Newer Post10 Reasons to start eating organic! Older PostA normal diet? Not according to your body.